Blogger is one of the most popular blogging platforms where you can create your own website or blog for free. There are a number of widgets available that you can add to your blog. Some of the widgets are pre-installed in your Blogger template like "Powered by Blogger" attribution widget. This widget allows you to add a copyright notice at the bottom (in the footer section) of your blog. Due to some reasons, Blogger has locked attribution widget which prevents you from deleting it directly. Here we have two simple workarounds that can help you to remove "Powered by Blogger" attribution widget from your blog. Login to your Blogger Dashboard, go to Template, and then click "Edit HTML" button. 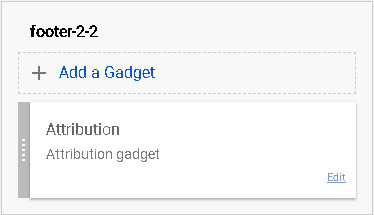 Now tap "Jump to Widget" button and click "Attribution1" from the drop-down list. Find the following code in the template editor and replace locked=’true’ with locked=’false’. After this, click "Save template" button to save the changes. Now you have successfully unlocked the attribution widget. To delete "Powered by Blogger" from your blog, go to Layout section and click edit link of the attribution widget. Now a pop up window will open. Tap "Remove" button here to remove the widget from your blog. Type ]]></b:skin> code and press the enter button to search for it. Now tap "Save template" button to save the changes. That's it. We hope you find this guide helpful in removing "Powered by Blogger" attribution widget from your blog. If you want to ask something about this tutorial, feel free to share it in the comment section.